Wow! What a moment. To have had my story published out in the public domain away from my own website. 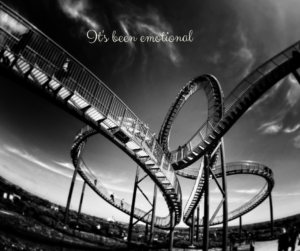 It was an emotional moment I can tell you – happiness, sadness, pride all hit me in a crescendo of emotions that felt like the wildest rollercoaster. But underneath it all it really just brought home how much emotion we have to deal with and hide. I talk about masks a lot and I talk about being a social chameleon. It’s having to pretend to the outside world that everything is fine, when inside we know it most certainly isn’t. It’s being all things to all people, but not being true to yourself, because you feel you cannot show how broken you feel. And I know it’s tough to start outing yourself as childless-not-by-choice. Believe me, it’s only in the last year that I started to talk about it with friends and it’s only since the start of 2018 that I have spoken openly about it to family and on Facebook. But it has got easier to talk about it openly and that culminated in my story being published on World Childless Week’s website (https://worldchildlessweek.net/facts-and-figures/100918-tick-tock). Hence my emotional rollercoaster. It was the realisation that I have a tough story to read, that I’ve worked hard to get to this point and that I’m dedicated to helping people, who have their own equally sad stories to tell, own them and be able to find happiness. And that’s just the start as shown by World Childless Week. #WorldChildlessWeek is there to start bringing our stories to the fore and to start a conversation or even a social movement. It can be hard talking about something so deeply personal and something that has been so defining to our lives, but if we want to put this issue into the spotlight, we need to start owning and talking about our stories. And at the risk of looking as though I’m climbing on my own soap box, we need to start looking at the emotions and owning them – yes there will be happiness and a lot of sadness, but we should be proud of the fact that despite the difficulties we have faced, we’re still here. Because let’s not beat about the bush here, it takes a lot of strength to be able to deal with this issue. To get out of bed every day, to do a job every day to carry on with life, when inside our hearts are breaking. And that takes guts and determination to do. So, don’t ever forget what an incredible person you are, when you're able to face life every single day.